Folding doors slide in pairs so when you have an odd number of panels one of them can operate independently as a traffic or access door. If your door is a main exit point for your property then it is smart to include an access leaf in your configuration for easy access. Like a traditional door, you can go out into your garden without needing to fold every panel back. There are different configurations available when including a traffic door, depending on whether you have an odd or even number of panels. With an odd number, you can choose to have all panels sliding one way with a traffic door hinged at the end. However this design wouldn’t work with an even number of panes and so you would need to split them so that an odd number of panels open in each direction. So your traffic door would open one direction and the remaining panels would open the other way. 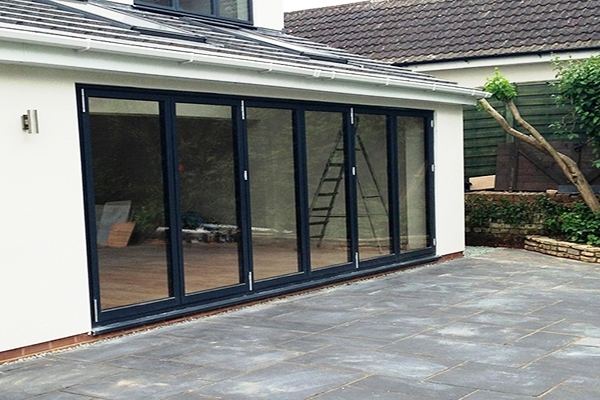 Two panel bi-folding doors are a stylish and unique solution when you need to replace your patio doors or French doors. Whereas a traditional two panel door has an entrance door that moves to sit behind the fixed panel, with a two panel bi-folding door both panes can slide to create a full opening. This makes them a stylish solution for a modern home and a great choice for making the most of a smaller space. With this folding door design, the panels can only move the same way so either both will slide to the left or to the right. 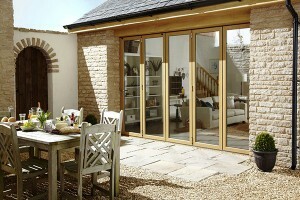 Three panel bi-folding doors are a popular choice for many homes as they provide more flexibility. With this folding door design you can choose from three opening options: all door panels slide to the left, all slide to the right or two slide in the same direction and one door is hinged as an access leaf or traffic door. This final option is particularly ideal for homes whereby patio doors are used regularly and provide access to the garden as you can use the access door like a traditional design without sliding all the panels back. Four panel bi-folding doors look amazing in spaces with a wider opening and offer four opening options. With four panels you can have them all moving to the left, all moving to the right or three folding back in one direction and one panel hinged as a traffic door. The final option available with this folding door design is the most popular choice when enough space is provided. Two doors, such as the centre two panels, swing open like traditional French doors, and the other two panels slide to each side. This provides a lot of versatility all year round and creates a fabulous feature in a room. Five panel bi-folding doors create an amazing glass feature and have a range of configurations to suit different sized spaces. Similar to other door designs, all door panels can slide and fold in one direction, whether left or right, and one door can be hinged as a traffic door if desired. Additionally, the five panels can be separated into a 3-2 design so that three fold in one direction and the other 2 move the other way. This split arrangement is often favoured in homes to avoid a bulk of folding doors at one end when the doors have been fully opened. Six panel bi-folding doors offer the same door configurations as four pane designs but with an additional panel at each end. The six leaves can all slide and fold to the left or the right, or be arranged into a 3-3 combination in which they move in opposite directions. The most common design with this many panels is to use an end leaf as an access door and have the other five panels slide to the opposite side. Alternatively, the traffic door could be hinged elsewhere in the door arrangement so that you have the desired number of panels moving either side to suit the space available. 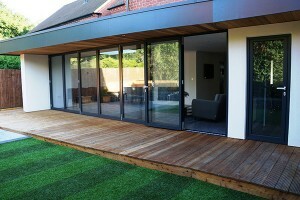 Seven panel bi-folding doors create a unique glass feature desired by any ultra stylish modern home, whether they are open or closed. A folding door with seven panels can be configured in the same way as a door with fewer panes. All panels can fold in one direction, left or right, or be split into arrangements to slide in both directions. 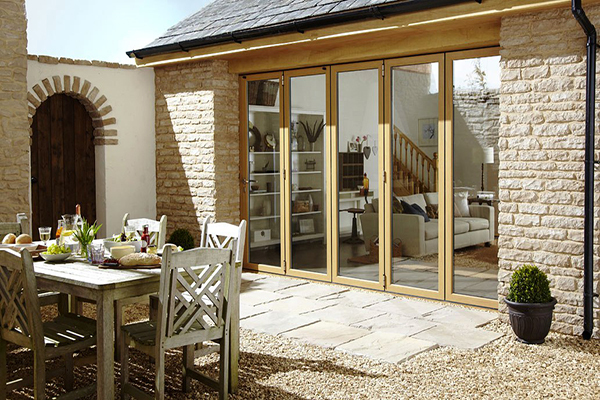 An access leaf can be added into the design or a French door opening can be worked in to suit your home. 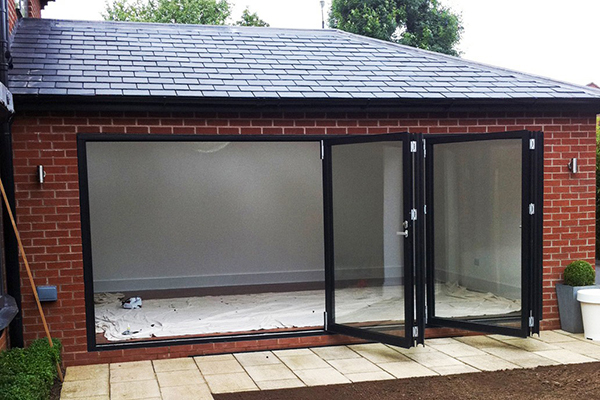 With a large bi-folding door such as this one, it’s important to consider the best arrangement for the space you have as not all homes will suit having seven stacked panels at one end of the opening. To discuss your requirements with one of our experts, fill out our contact form and we’ll get back to you. 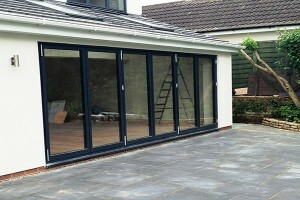 Or if you know what size doors you require, get a free installation quote emailed to you in seconds! 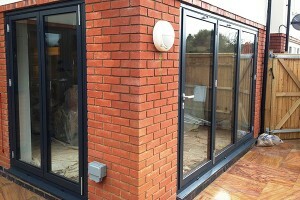 Top 5 Benefits of Bi-Fold Doors How Much Do Aluminium Bifold Doors Cost?